As a maximum care clinic, the Department of Adult and Pediatric Ophthalmology at the University Hospital Saarland offers the full range of services in this ​​medical focus. To provide comprehensive medical care, the department has a modern infrastructure: operating rooms equipped with the state-of-the-art technology, various innovative laser devices for diagnostic and invasive procedures, a specialized outpatient clinic for the treatment of neuro-ophthalmic diseases and visual impairment in children. A special feature of the department is the LIONS Saar-Lor-Lux Eye Bank, within which the removal, cultivation and transplantation of the cornea is performed. The department is headed by Prof. Dr. med. Berthold Seitz. In the field of outpatient treatment, the focus is on the therapy of corneal, retinal, macular, eyelid and orbital diseases, as well as on the treatment of glaucoma. The treatment of patients with cataract is provided within the specialized outpatient surgical center (about 2,800 operations per year). Also, this center offers many sparing techniques for eliminating other vision problems, surgical treatment planning and diagnostics. The spectrum of outpatient services is complemented by intravitreal injections for the treatment of macular degeneration, a wide range of eyelid surgery and laser therapy for the treatment of glaucoma, changes after cataracts, retinal diseases in diabetes mellitus. 11/1981 - 05/1988 Study of Medicine at the Friedrich-Alexander University in Erlangen. 05/1988 Admission to medical practice (approbation). Since 07/1989 Fellow and Assistant Physician in the Department of Ophthalmology at the University Hospital Erlangen-Nürnberg. 09/1993 Medical Specialist in Ophthalmology (Munich). 05/1996 European Examination Board, Exam in Ophthalmology, Paris (FEBO). Since 09/2002, C3 Professor and Associate Professor in Ophthalmology. Since 03/2006, Head of the Department of Ophthalmology at the University Hospital Saarland. Professional Association of Ophthalmologists in Germany (BVA). European Association for Vision and Eye Research (EVER). Association of German Eye Banks. 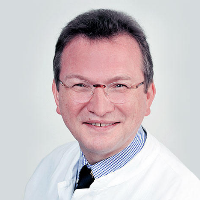 Founding Member and Representative of the Section for Corneal Diseases in the German Ophthalmological Society. International Society of Dacryology and Dry Eye (ISD&DE). European Eye Bank Association (EEBA). European Society of Cataract and Refractive Surgeons (ESCRS). Member of the National Academy of Naturalists "Leopoldina". German Committee for the Prevention of Blindness (DKVB).